Just in case you were wondering, the Smoky Look is in. It started out innocent enough. My bestie (who said she wanted to be called “Lola” from now on in my blog…and that’s really the perfect name for her! ), called and said she was getting off work early and did I want to meet her at the new makeup store. Hmmmm, lemme think a minute. Never mind, 10 seconds was all I needed, cause I was ALL in. I had already showered, so that was a plus ~ no stinky Sasha in public. I had on little makeup and had done hardly anything to my hair, (I’m thinking we’re going ‘Messy Casual’) but no biggie. I mean, we’re just going to the make up store….maybe I could get some makeup there. (I don’t think they had any hair help….) Once we get there, we are stopped in our tracks by ALL the finishes for faces. I realize I am in WAY over my head. I mean, I’m a ‘slap some foundation on, some blush and powder, swipe a few strokes of eye shadow on the wrinkled eye lids and add about a hundred mascara applications’ and I’m good to go. But this…THIS was like Make Up for Pros. Or at least people who did a lot more than I did. The very lovely, very made up (BIG FLIPPIN CLUE), very friendly employee approached us as we were standing there, slack-jawed and confused. I had hoped we didn’t appear that way, but apparently it was VERY obvious. She said the words that I will never forget….and ones that I should run from if I ever hear them again: Would you like a Make Over? Sure! That sounds like fun. What a sucker I am….. I hop up onto the stool (fine…I crawl one bad knee at a time), hand my pocket-book to Lola and say, “Whatcha gonna do?” Made up Employee: Well, we’ve got some new colors that really POP and give a Great DRAMATIC look to your Eyes that I’d love to TRY. I think you’d look beautiful with the SMOKY look. (All key words I neglected to hear because the word beautiful was stuck in my ear.) Me: OKAY! Sounds good to me. HEAVILY Made up Employee: Great. Just close your eyes and don’t peek until I’m finished. I wish I could say I knew what she used, but I was a good little customer guinea pig, and didn’t peek one time. And it’s a good thing, too, because if I had opened my eyes mid-makeover, I’m sure I would have left the store only half made up. Which, come to think of it, might not have been a bad idea. When VERY Heavily Made up Employee lady finished, she whirled me around in that tall bar stool with a back (thank the good Lord for that), and said “Ok, what do you think?” I think my good acting skills took over because I did NOT jump up screaming and run from the counter. 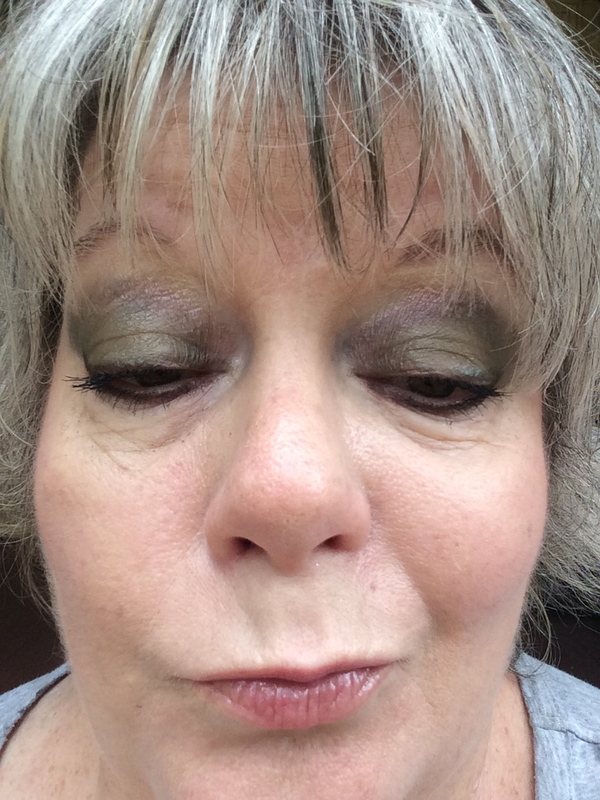 What I did say was, “Well….I never used quite that much eye shadow before. Are those ‘wings’ coming out from my eyes? That’s a LOT of eye liner. And I usually like a little darker lipstick.” She told me the new ‘style’ was pale lips and cheeks and DRAMATIC Eyes for Fall. I’m pretty sure she nailed it. I waited until I got to the car to take pictures, but you just can’t see the VERY DARK AND VERY DRAMATIC look as well as I can when I look in the mirror. Of course, when I got home and went over to Mama and Daddy’s to check on them, Mama asked what happened to my eyes. I tried to explain it was the new DRAMATIC Look for Fall but I’m not sure she was buying it. A dollar says she’ll ask Daddy if I got in a fight…. Thanks so much for reading what I write ~ I really appreciate it. It’s even funnier is you’re drinking a margarita when you read it….or maybe it’s just funnier if I’m DRINKING a margarita when I read it….whatever. Previous If you don’t ask, you’ll never know…..
Oh Lawd…that Is Funny! I’m so sorry your face melted, but wouldn’t just love to have been in the store when it started so you could show the make up “Artist”…Bless. Her. Heart! Hi Sasha! I think she did a nice job and you look great, but you’re right, not for Dollar General store! LOL!!! Lynda ~ Yep, I’m thinking ‘night out on the town’ – ha! Love it. I went to Sephora before my son’s wedding just to pick up some new brushes, got talked into a makeover and decided what the heck, so let her at me. When she finished, she said would you like to purchase the things I used. So not wanting to hurt her feelings since she spent an hour making me look worse than when I walked in, I said sure. Got to the register and the bill was…………drum roll, please………….$400. I nearly died. But again, not wanting to embarass myself, I acted as though I always paid $400 for a half dozen items and left. Next day I figured they would never recognize me since I was back to myself, I returned all but the brushes I had originally gone in for!! Give me good old CVS for makeup!! Cyn ~ OMG… $400!! I would have been in shock! And yes..you feel like you HAVE to go along with it, doncha? WHY do we do that ? So glad you took it all back and got what you wanted! Cheers! Margaritas make life eay more fun!! Tracey ~ Margaritas….they make me happy 🙂 And I have huge circles under my eyes, not so dark, but lots of wrinkles and circles…I’m thinking I could color those in maybe … 😉 Have a fabulous week!!! Have a fabulous week as well Sasha!!! Very pretty! Just lighten it up a tad when you go to Dollar General! Plus, you are probably looking very closely at your face; most people will be standing at least three feet from you, and you look beautiful to them! Those colors are very nice on you; smoky eyes in the jewel-tones are hot for fall. Candis ~ Truth about that looking closely part – ha, I was 2 inches from the mirror going OMGOMGOMG! Thanks!! You look lovely ~ I wear my “Smokey Eyes” anywhere I want, anytime I want. Momma said I could do that when I turned 50. You know, anything, anytime, anywhere……whatever you feel like! Anjela…and Momma was RIGHT! I gotta feel more comfortable with more makeup…I’m pretty minimal, but am working on adding more so I can be exotic…bwahahahaha!! I think it looks great! But I think you need a little more color on the cheeks and lips. Great for nighttime margarita drinkin! For my Dollar general runs they are lucky if I’ve changed from my pajama pants and tshirt. And have added a bra. Sonja ~ Yeah, I could NEVER do the pale lipstick and cheeks. I need some COLOR. Just not that much color on my eyes!! And yes…dollar general is lucky if I have on clothes instead of pajamas, too! Way too much for WalMart and Dollar General but for a night out with Mac I think it would be awesome! That’s pretty much EXACTLY my motto…if I’m at home and not going anywhere, there’s no makeup….unless it’s from the night before – ha! Sorry….I like it! Of course you’re always glamorous! Joy! Thanks ~ I think it looks good in these pictures…but in person in front of my mirror?? Oh my !! I think the smoky eyes look great on you.